A custom fragrance that represents the reaching of the Moon to the Earth. With the Moon as the root mass for the tree, its branches reach out and form the Earth and all of its entities. A transparent triangular prism optical element with flat, polished surfaces that refract light. A dispersive prism can be used to break light up into its constituent spectral colors (the colors of the rainbow). Gold nano-particles formed as icosahedrons in reference to the Euclidean geometry of plankton. Gold is used for critical and high-definition electrical connections as it retains its conductivity because it does not tarnish or corrode when exposed to air. Synthetic regolith can be used to make high definition mirrors and other structures on the Moon. 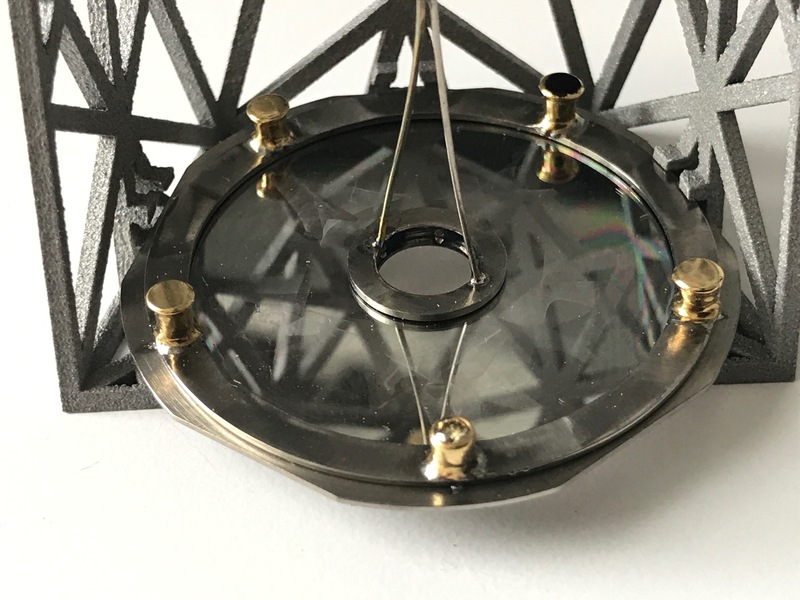 As a speculative project, NASA is exploring the fabrication of very large mirrors out of lunar regolith on the Moon’s surface to be able to see further into deep into space than we can with telescopes. Synthetic regolith from the U.S. and China space agencies is used here to express a wish that all space faring organizations could work in cooperation to move humanity further into space.